Ice and cold describe my January 2018. Our dog snores in his bed near the wood stove. The wood pile lowers as we pull from it to feed the flames. I think of Galway Kinnell’s poem, Another Night in the Ruins. The flames in his poem might be our creative spirits, our deeply felt lives. The narrator of the poem remembers his brother’s warning — the day offers nothing; it is the night when the bonfire lights the entire sky. But to light the flames, we must be the flame. We must, like the rooster in the poem, let go of all of our ‘ink-spattered feathers', our failures, our half-hearted efforts, our old and accustomed habits; we must hurl ourselves into the unknown, and with single-minded effort search for the single grain, the true grain that will nourish, that will deeply warm our souls. lightning-flashed moments of the Atlantic. “What good is the day? our cast wings, our ink-spattered feathers. bursting out of his brow. Today is for poetry at Old Frog Pond Farm. This afternoon, twenty-four poets will gather and walk the trail around the pond and through the woods, along the orchard, to the meditation hut, with a stop at the rock turtle, and back to the dam. The poets will be reading the poems they began writing earlier in the year inspired by a visit to the farm. Early in the year, Susan Edwards Richmond, organizer of the event, and I, choose a theme. This year’s subject, Memoir, “invited the poets to dig deeper, to go beyond surfaces, and draw, sometimes unbidden, wells of feeling from the landscape,” wrote Richmond in her introduction to the chapbook of poems. Poets sign up to participate. Throughout the spring and early summer, they visit the farm and walk the paths. When they come upon a view, a place, a tree, or a sound that awakens their muse, they stop and write. They return home, work on their poems, sometimes visiting again. In mid-summer, they submit their poems to Richmond, editor of the chapbook. For some, Richmond responds with suggestions, working closely with the writer to enhance the poem; others’ work arrives fully fledged. Then Richmond orders the collection, giving shape not only to the book, but to the walking event. Our slow-moving herd of poetry appreciators can’t be running from the dam to the orchard to the bell; then flying to the meditation hut and back again — or the walk would take us far into the evening hours. Some poets invite us to feel the plight of the greater world. Linda Fialkoff writes, “So many refugees/choked into one small boat/fueled by a damp, ragged/body long held hostage.” It is as if she knew that Alicia Dwyer’s Suspended Encampment, a hanging sculpture behind the Medicine Wheel, would be arriving for the sculpture exhibit. Dwyer’s sculpture not only refers to the plight of Monarch butterflies, but to the migrations of people, the refugees throughout Europe, and now, the homeless millions in the aftermath of the recent violent storms and earthquakes. Richmond and her husband brought their children to pick raspberries at this farm years before I moved in, and she was so happy when she learned that I would continue to care for the patch and open it for public picking. Since that time, Richmond and I have collaborated on many projects — Wild Apples, a journal of nature, art, and inquiry, five years of Plein Air Poetry at the farm, and our most recent collaboration, a children’s book, Where’s My Bonkers? about a girl, her mother, and an apple. It’s always about collaboration at the farm. We share, inspire, and co-create together. We invite you to join us this afternoon, Sunday, September 17 at 2pm to walk and listen to the poets read their poems. I guarantee you will be sated. If you can’t make the event, a limited number of chapbooks will be for sale at the farmstand and on the farm’s website. The walk is free and open to the public. Ekphrasis is a genre of writing about a work of art. Homer’s lengthy and vivid description of Achilles' shield in The Iliad is one of the oldest examples, though Keat’s Ode to a Grecian Urn is more quoted, especially its enigmatic last lines. The writer, and most often a poet, explores a work of art, responds to it, even adds elements from his or her own life. The Poetry Foundation defines an ekphrastic poem as follows: “Through the imaginative act of narrating and reflecting on the ‘action’ of a painting or sculpture, the poet may amplify and expand its meaning.” I love this description and thought about it when I sat down to write a statement about a new sculpture I am exhibiting at 6 Bridges Gallery in Maynard, Massachusetts (July 11 – August 12). To write about, Meeting, I started by considering its materials — rope and wood. Rope is used to connect one object to another, a canoe to a tree or a skiff to a dock. A rope hammock connects two trees. What intrigued me when I placed the thick rope into the walnut trunk was that it connected back to itself. There was no connecting of two objects but a unifying of the whole. The ends disappeared as if there were no ends. This section of a tug-of-war-size rope has been in my studio for six years ago. Back then, I suspended it, tied it, uncoiled part of it, and wove it back into itself. When I hung up the heavy coil, it made me think of a Japanese Enso, the circle that is an expression of enlightenment, the ultimate connection with everything because there is nothing inside or outside, nothing separate or divided, nothing to connect, no beginning and no ending. I then wrapped a thin white twine around the rope, the way a snake coils around a stick. It reminded me of a painting I saw in a small church in Florence. Christ was nailed to the cross alone up on Calvary Hill. There was a simple white cloth wrapped around his pelvis, the cloth painted as if being blown by a gentle breeze. The body was dead, but life stirred in the simplicity of the white threads. The painter may have been suggesting that life is never completely extinguished. The wood component of the sculpture, a walnut trunk, sawn twice to reveal its two hollow sections, has also been in my studio for a number of years. A bronze sculpture I made of Kwan Yin, the Goddess of Compassion, sat on it for a while, but I removed her knowing the wood had something else to reveal. One day I took the tug-of-war rope and threaded it through and around the wood. I was intrigued by what I saw, but also by what I didn’t see. In Meeting, we don’t actually see whether the two ends of the rope meet. It’s a question that is unanswered. The rope, in its serpentine path around and into the trunk reveals only part of itself. It is like happening upon a snake, though the head and tail are hidden. Meeting is the word for the worship practice of the Quakers. I went to a Quaker elementary school where we had ‘meeting for worship’ on Wednesday mornings. We sat in silence unless someone was moved to speak. In a Quaker Meeting, we meet ourselves, we meet God, we meet each other. Art is a form of meeting. We meet the work, its materials, colors, and forms, the artist and ourselves. Ekphrasis writing is a form of meeting. When I write about my own work, I discover connections that I had never considered while making the piece. And when I read the writing of others who have been inspired my art, I encounter the work differently. At another summer exhibit where I have a sculpture, Art on the Trails: Finding Solace in the Woods at the Beal Preserve in Southborough, MA (June 7 – September 24), there will be a reading of ekphrastic poems written about the works of the exhibiting artists. I have a new casting of Tree Harp in the exhibit and hope there will be a poem written about it. I much prefer to hear what others write about my sculpture. An ekphrastic poem that I treasure was written by Joanne Reynolds about my sculpture Ordinary Pine when it was installed at the Jackson Homestead in Newton, Massachusetts. Will become of us now? More borrowed than your own. As a go-between - a link. To the youngest - your great hands - how well they played! Cut down, I long to see you. Such a hole in each of us. When you ride in a boat and watch the shore, you might assume that the shore is moving. But when you keep your eyes closely on the boat, you can see that the boat moves. Similarly, if you examine myriad things with a confused body and mind you might suppose that your mind and nature are permanent. When you practice intimately and return to where you are, it will be clear that nothing at all has unchanging self. Tr. Tanahashi et al. I made boats in wax — boats with one figure, boats with fish, boats with two figures, boats overturned on a beach, a figure emptying water from a boat, a figure birthing a boat. There was nothing fixed in my play with the wax sculptures — only an endless reconfiguring of figures, boats, and fish. I showed some of these sculptures to friend and poet, Susan Edwards Richmond. She wrote, River Crossings, a poem in five parts based on several of the sculptures. It was originally published in Issue One of Wild Apples, A Journal of Nature, Art, and Inquiry that we founded together with two friends in 2005. [There are back copies still available]. of a hand . . .
from the river, lodged in my arms. Richmond’s poem has just been reprinted and is the final section in her first full full-length poetry collection, Before We Were Birds, published last month by Adastra Press. This fine collection begins with the poem sequence Boto, the mysterious freshwater Brazilian dolphin that rises from the Amazon River on full moon nights. A Boto is a shapeshifter who takes human form to catch humans, and even bring them back to live deep in the river. In Dogen’s, Mountains and Rivers Sutra, he refers to sages who live near water and catch fish, and catch humans. In this same sutra, Dogen uses expressions like riding the clouds and following the wind to describe states of meditative practice and transcendence. The mountains and rivers are none other than our own body and mind. How do we ride the wind and cross each river? out of the water nor into it. the one that leaves no wake. 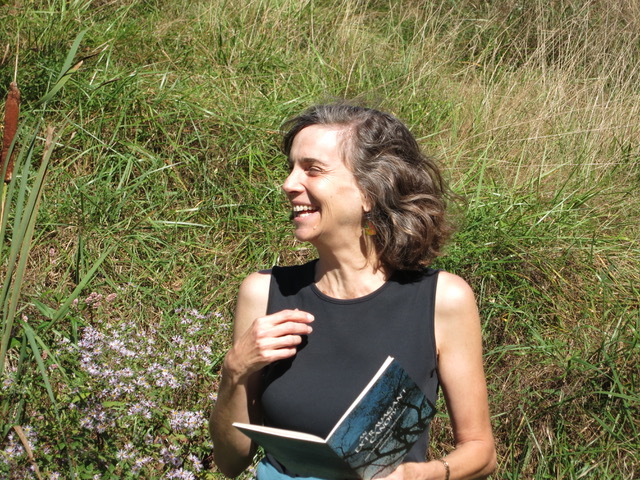 Susan Edwards Richmond has published four chapbooks of poetry, Increase, Purgatory Chasm, Birding in Winter, and Boto. A passionate birder, she works at Mass Audubon’s Drumlin Farm Wildlife Sanctuary. Richmond is poet-in-residence at Old Frog Pond Farm & Studio, edits the Plein Air poetry chapbook, and organizes our Plein Air Poetry event every fall. We are also working on a series of children’s books on sustainable agriculture. I am grateful, Susan, for our ever widening collaborations.